As I have entered this new journey as a mother, I selfishly want to do everything I can to create the community I have in my professional life in my life as a mother. With that, I feel it is my duty to give back to others, the way that other mothers that have helped me along the way thus far. Stumbling upon the Aspen Moms for Moms site was my “ah-ha”. I knew the site would be a tremendous asset to myself and once the site became available, I knew (know!) that I can take it to the next level to foster the sense of community in the Aspen and Snowmass areas. Virginia Edelson lives in Old Snowmass with her husband Jeff, son Zach and Labrador Zara. 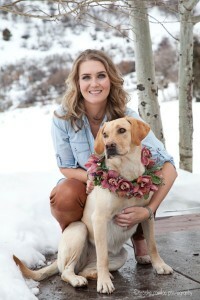 She moved to the Roaring Fork Valley after graduating from the University of Virginia. In her almost 10 years in the valley, she has taught skiing, managed events at The Little Nell, launched Bluebird Productions, an event coordination company, and started a “real life” in the valley. She met her husband Jeff here. Soon thereafter, a home and their dog Zara followed. Her son Zachary was born in December of 2014. Virginia tends to throw herself wholeheartedly into each element of her life thus, her new role of “Mom” is not taken lightly. Virginia has always been a “connector.” She loves connecting people: acquantainces, friends, and family. Developing and creating a sense of community has always been important to her. Moms for Moms offers just that: a fabulous platform to connect people and provide them with a sense of community. She is excited and honored to take on the role as part of Aspen Moms for Moms to take this platform to the next level and create a deeper sense of community.